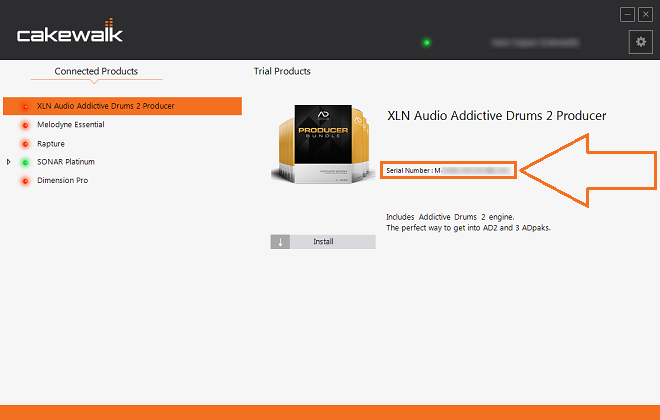 A full license for XLN Audio's Addictive Drums 2 is included with your SONAR purchase. In addition, SONAR Platinum includes three (3) ADpaks and SONAR Professional includes one (1) ADpak. These products are downloadable by using the XLN Online Installer, which is available as a separate download from XLN Audio. The computer on which you are installing Addictive Drums and your ADpaks must be connected to the Internet in order to install this software. To download, please go to: http://www.xlnaudio.com/install and click Windows Online Installer. This will download the xln-online-installer-win.zip file, which contains the XLN Online Installer. Right-click this file, select Extract All… then the [Extract] button. A new folder called xln-online-installer-win will appear, open it then double-click XLN Online Installer 64-bit (if you’re using 32-bit Windows, double-click XLN Online Installer 32-bit) then follow the prompts to sign into your XLN Account and begin downloading Addictive Drums 2 and your ADpak(s). You will need your Addictive Drums 2 product key, which is available at https://www.cakewalk.com/My-Account/Products and in the Cakewalk Command Center (see the image below).